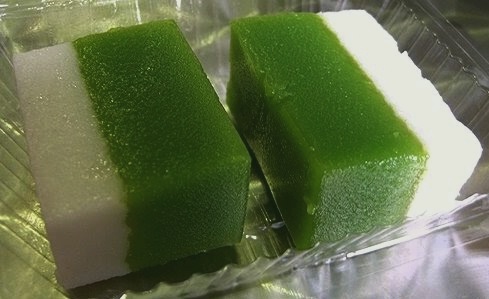 Kuih Talam is a popular delicacy malay cake that is consisting of two layers.The top white layer is made from rice flour and coconut milk and while the bottom green layer is made from rice flour, green pea flour or corn flour, alkaline/lye water and extract of pandan leaf. If you don’t want to use alkaline water for the Kuih Talam you can omit it. When cool to touch, cut into diamond or triangular shapes, serve warm or cold.